NOTE: Dads do this too, but I will let it slide as a “mom” piece. Author unknown. Inside I’m thinking, ‘Can’t you see I’m on the phone?’ Obviously not; no one can see if I’m on the phone, or cooking, or sweeping the floor, or even standing on my head in the corner, because no one can see me at all. One night, a group of us were having dinner, celebrating the return of a friend from England .. Janice had just gotten back from a fabulous trip, and she was going on and on about the hotel she stayed in. I was sitting there, looking around at the others all put together so well. It was hard not to compare and feel sorry for myself. I was feeling pretty pathetic, when Janice turned to me with a beautifully wrapped package, and said, ‘I brought you this.’ It was a book on the great cathedrals of Europe . In the days ahead I would read – no, devour – the book. And I would discover what would become for me, four life-changing truths, after which I could pattern my work: No one can say who built the great cathedrals we have no record of their names. At times, my invisibility feels like an affliction But it is not a disease that is erasing my life. It is the cure for the disease of my own self-centeredness. It is the antidote to my strong, stubborn pride. I keep the right perspective when I see myself as a great builder. As one of the people who show up at a job that they will never see finished, to work on something that their name will never be on. The writer of the book went so far a s to say that no cathedrals could ever be built in our lifetime because there are so few people willing to sacrifice to that degree. 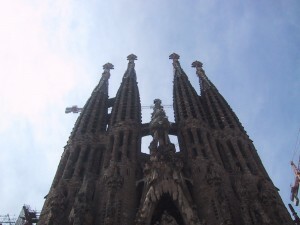 9 Comments on "The Invisible Mom–Building Cathedrals"
I am not sure of the title myself! Wonderful and beautiful because it is filled with an abundance of powerful truth for Moms and Dads everywhere. Thanks for sharing this important message of unconditional love that inspires right parenting and helps to grow healthy children. It is a reflections of True Values that guide behavior, especially through challenging times. Thank you so much for this. I have been having a rough couple of weeks and this puts it all in perspective. God sees. That’s all I need to know. Thank you! I love this so much though I find it odd no one has answered about the title of the book. There are a few out there, could you share the correct title mom? Yes, please share the book and author! !